ChemBond™ putty is applied to the slip collar portion of the ATS Slip Collar Flange™. Apply a layer approximately 1/8” (3mm) thick. 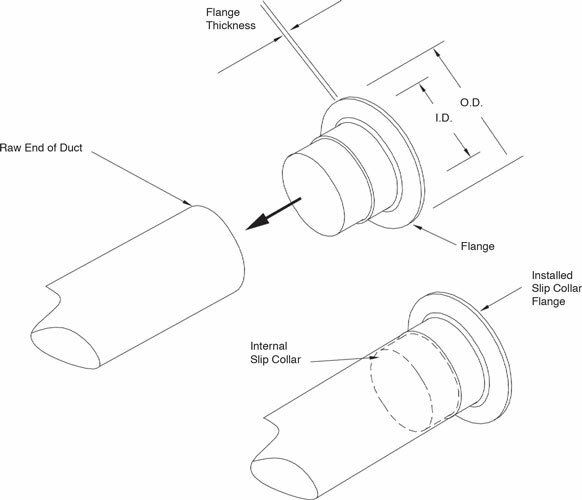 Insert slip collar flange into the duct. The putty will ooze around the outside of the slip collar flange and it will also squeeze out from under the slip collar on the inside. Smooth the putty on the interior to create a beveled surface. On the inside and outside of the joint, the ChemBond™ putty should be beveled by hand.